Indigenous Australians have occupied Australia for some 65,000 years, during which they developed a unique hunter-gatherer diet, known as bush tucker, drawn from regional Australian flora and fauna. Australia became a collection of British colonies from 1788 to 1900, during which time culinary tastes were strongly influenced by British and Irish migrants, with agricultural products such as beef cattle, sheep and wheat becoming staples in the local diet. The Australian gold rushes introduced more varied immigrants and cuisines, mainly Chinese, whilst Australia's post-war multicultural immigration program led to a large-scale diversification of local food, particularly under the influence of Mediterranean and East and South Asian Australians. Australian cuisine in the 21st century reflects the influence of globalisation, with many fast-food restaurants and international trends becoming influential. Organic and biodynamic foods have also become widely available alongside a revival of interest in bushfood. Australia has become famous for the high quality of its exports, with major agricultural industries including cattle and calves, wheat, fruit and nuts, vegetables, milk, sheep and lambs (for meat and wool), poultry, barley, canola. The country is also well regarded for its locally-made wine, beer and soft drinks. While fast food chains are abundant, Australia's metropolitan areas have famed haute cuisine and nouvelle cuisine establishments that offer both local and international foods. Restaurants whose product includes contemporary adaptations, interpretations or fusions of exotic influences are frequently termed Modern Australian. Bush tucker (bushfoods) harvested at Alice Springs Desert Park. Indigenous Australians have lived off the often unique native flora and fauna of the Australian bush for over 60,000 years. In modern times, this collection of foods and customs has become known as bush tucker. It is understood that up to 5,000 species of Australian flora and fauna were eaten by Indigenous Australians. Hunting of kangaroo, wallaby and emu was common, with other foods widely consumed including bogong moths, witchetty grubs, lizards and snakes. Bush berries, fruits, and honeys were also used. Fish were caught using technologies such as spears, hooks and traps. Resource availability and dietary make-up varied from region to region and scientific theories of bush tucker plants being spread by hand have recently emerged. Food preparation techniques also varied, however a common cooking technique was for the carcass to be thrown directly on a campfire to be roasted. Native food sources were used to supplement the colonists' diet following the arrival of the First Fleet in Botany Bay in 1788. Chinatown, Melbourne. Multiculturalism has contributed to the development of a diverse local cuisine in Australia. Following the pre-colonial period, British colonisers began arriving with the First Fleet of ships at Sydney harbour in 1788. The diet consisted of "bread, salted meat, and tea, with lashings of rum (from the West Indies, but which was later made from the waste cane of the sugar industry in Queensland)." The British found familiar game in Australia including swan, goose, pigeon and fish, but the new settlers often had difficulty adjusting to the prospect of native fauna as a staple diet. After initial difficulties, Australian agriculture became a major global producer and supplied an abundance of fresh produce for the local market. Stock grazing (mostly sheep and cattle) are prevalent throughout the continent. Queensland and New South Wales became Australia's main beef cattle producers, while dairy cattle farming is found in the southern states, predominantly in Victoria. Wheat and other grain crops are spread fairly evenly throughout the mainland states. Sugar cane is also a major crop in Queensland and New South Wales. Fruit and vegetables are grown throughout Australia and wheat is a main component of the Australian diet. Today there are over 85,681 farm businesses in Australia, 99 percent of which are locally owned and operated. Barbecued meat is ubiquitous with Modern Australian cuisine, though it is estimated that more than 10% of Australians are now vegetarian. 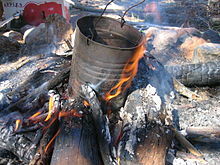 A traditional billycan on a campfire, used to heat water. Billy tea is the drink prepared by the ill-fated swagman in the popular Australian folksong "Waltzing Matilda". Boiling water for tea over a camp fire and adding a gum leaf for flavouring remains an iconic traditional Australian method for preparing tea, which was a staple drink of the Australian colonial period. The nation also has a longstanding dairy industry (virtually from colonisation) and today produces a wide variety of cheeses, yoghurts, milk, cream, and butter products. Australians are high consumers of dairy products, consuming (on average) some 102.4 L of milk per person a year (in part is due to its quality-coffee culture), 12.9 kg of cheese, 3.8 kg of butter (a small reduction from previous year, largely for dietary purposes) and 7.1 kg of yoghurt products. The chocolate and malt powder Milo, which was developed by Thomas Mayne in Sydney in 1934 in response to the Great Depression, is mixed with milk to produce a popular beverage. In recent years, Milo has been exported and is also commonly consumed in Southeast Asia even becoming a major ingredient in some desserts produced in the region. Six Australian beers. XXXX Gold was Australia's top-selling beer by volume in 2012. The Australian wine Industry is the fifth largest exporter of wine around the world, with 760 million litres a year to a large international export market and contributes $5.5 billion per annum to the nation's economy. Australians consume over 530 million litres annually with a per capita consumption of about 30 litres – 50% white table wine, 35% red table wine. Wine is produced in every state, with more than 60 designated wine regions totalling approximately 160,000 hectares. Australia's wine regions are mainly in the southern, cooler parts of the country, in South Australia, New South Wales, Victoria, and Western Australia. Amongst the most famous wine districts are the Hunter Region, Margaret River, Yarra Valley, and Barossa Valley and among the best known wine producers are Penfolds, Rosemount Estate, Wynns Coonawarra Estate and Lindeman's. Beer in Australia has been popular since colonial times. James Squire is considered to have founded Australia's first commercial brewery in 1798 and the Cascade Brewery in Hobart, Tasmania, has been operating since the early 19th century. Since the 1970s, Australian beers have become increasingly popular globally - with Fosters lager being an iconic export brand. However, Fosters is not a large seller on the local market, with alternatives such as Victoria Bitter & Carlton Draught outselling the popular export. Craft beer is popular, as well as distinctive products from smaller breweries such as Coopers and Little Creatures. Rum served as a currency during the late 18th and early 19th centuries in Australia when metallic currency was in short supply. A flat white with latte art. Australia has a distinct coffee culture. The coffee industry has grown from independent cafés since the early 20th century. The flat white first became popular in Australia, and its invention is claimed by a Sydneysider. The iconic Greek cafés of Sydney and Melbourne were the first to introduce locally roasted coffees in 1910. In 1952, the first espresso machines began to appear in Australia and a plethora of fine Italian coffee houses were emerging in Melbourne and Sydney. Pelligrini's Espresso Bar and Legend Café often lay claim to being Melbourne's first ‘real’ espresso bars, opening their doors in 1954 and 1956 respectively. This decade also saw the establishment of one of Australia's most iconic coffee brands, Vittoria, which remains the country's largest coffee maker and distributor. The brand has existed in Australia since 1958, well before it moved to the US. There are many species of Australian native fruits, such as Quandong (native peach), Wattleseed, Muntries / Munthari berry, Illawarra plums, Riberry, Native Raspberries and Lilli pillies. These usually fall under the category of "bush tucker", (bush foods), which are used more commonly in restaurants and used in commercial preserves and pickles but are not generally well known to Australians due to low availability. Australia also has large fruit growing regions in most states for tropical fruits in the north, stone fruits and temperate fruits in the south which has a mediterranean or temperate climate. The Granny Smith variety of apples first originated in Sydney, Australia in 1868. Another well-known Australian apple variety is the Cripps Pink, known locally and internationally as "Pink Lady" apples, which was first cultivated in 1973. Fruits cultivated and consumed in Australia include: apples, banana, kiwi fruit, oranges and other citrus, mangoes (seasonally), mandarin, stonefruit, avocado, watermelons, rockmelons, lychees, pears, nectarines, plums, apricots, grapes, melons, papaya (also called pawpaw), pineapple, passionfruit and berries (strawberries, raspberries etc.). Kangaroo, emu and crocodile meat is available in Australia, although it is not among the most commonly eaten meats. In colonial recipes, kangaroo was treated much like ox tail, and braised until tender forming a rich gravy. It is available today in various cuts and sausages. Lamb is very popular in Australia, with roasting cuts (legs and shoulders), chops, and shanks being the most common cuts. Lamb will often form part of either a Sunday roast or a barbecue. It is also commonly found as an ingredient in doner kebabs, a dish of Turkish origin that has been popular in Australia since the 1970s. Australia consumes more sheep meat than any other country listed by the OECD-FAO (with Kazakhstan in second place). In 2017, Australians consumed an average of 8.5 kilograms (19 lb) per person. By way of comparison, New Zealanders average 3.2 kilograms (7.1 lb) and Americans just 0.4 kilograms (0.88 lb). Seafood consumption is increasing, but it is less common in the Australian diet than poultry and beef. The most common species of the aquaculture industry are: salmonids, tuna, edible oysters, pearl oysters and prawns. Other species include: abalone, freshwater finfish (such as barramundi, Murray cod, silver perch), brackish water or marine finfish (such as barramundi, snapper, yellowtail kingfish, mulloway, groupers), mussels, ornamental fish, marine sponges, mud crab and sea cucumber. Bay lobsters, better known in Australia as Moreton Bay bugs (after Moreton Bay) are common in seafood restaurants, or may be served with steak as "reef & beef". While inland river and lake systems are relatively sparse, they nevertheless provide freshwater game fish and crustacea suitable for dining. Fishing and aquaculture constitute Australia's fifth most valuable agricultural industry after wool, beef, wheat and dairy. Approximately 600 varieties of marine and freshwater seafood species are caught and sold in Australia for both local and overseas consumption. European carp, common in the Murray as an invasive species is not considered edible by most Australians despite being common in cuisines across Europe. Australian cuisine features Australian seafood such as southern bluefin tuna, King George whiting, Moreton Bay bug, mud crab, jewfish, dhufish (Western Australia) and yabby. Australia is one of the largest producers of abalone and rock lobster. Fish and chips is a take-away food that originated in the United Kingdom and remains popular in Australia. It generally consists of battered deep-fried fish (often flake rather than cod which is more common in the UK) with deep-fried chipped (slab-cut) potatoes. Flathead is also a popular sport and table fish found in all parts of Australia. Barramundi is a fish found in northern Australian river systems. In the temperate regions of Australia vegetables are traditionally eaten seasonally, especially in regional areas, although in urban areas there is large scale importation of fresh produce sourced from around the world by supermarkets and wholesalers for grocery stores, to meet demands for year-round availability. During Spring: Artichoke, Asparagus, Bean shoots, Beetroot, Broccoli, Cabbage, Cauliflower, Cucumber, Leek, Lettuce, Mushrooms, Peas, Rhubarb, and Spinach. During Summer: Capsicum, Cucumber, Eggplant, Squash, Tomato, and Zucchini. Damper (soda bread) being cooked over hot coals. Iconic Australian foods include ANZAC biscuits, lamingtons, Tim Tams, fairy bread and Vegemite, a vitamin-rich, savoury brewers yeast which is spread on toasted bread. Another iconic dish is pavlova but the origins of this meringue-based cake are contested, with New Zealand also laying claim to its invention. Damper is a traditional Australian soda bread prepared by swagmen, drovers and other travellers. It is a wheat flour based bread, traditionally baked in the coals of a campfire. The Australian hamburger consists of a fried beef patty, served with shredded lettuce and sliced tomato in a (usually toasted) bread roll. Tomato sauce (similar to ketchup but made with less sugar with a more liquid texture) or barbecue sauce are almost always included. Beetroot and fried onions are also common additions, and sometimes sliced pineapple. Other frequently-served hamburger options are bacon, fried egg and cheese. Pickles are rarely included, except in burgers from American chains. A common takeaway food is the meat pie, often found at bakeries and especially popular at AFL matches. In Adelaide, a common variant is the pie floater, which is a meat pie served in a bowl of pea soup. Barbecue sausages are common as a street food, becoming iconic for their availability outside most Bunnings. They are served in a slice of white bread optionally with onions and tomato sauce. As well as national icons there are many regional iconic foods. South Australia has pasties - based on cornish pasties, fruchocs, King George Whiting, and a range of food of German origin including metwurst, beesting, kuchen streusel (German cake) and fritz. The state has its own iconic brands such as Farmers Union Iced Coffee, YoYo biscuits, Balfours Frog Cakes. Jubilee cake is a specialty of South Australia. Victoria is also famous for its home-grown Melbourne invention, the dim sim. Tasmania has leatherwood honey and abalone. Queensland has Weis Fruit Bar and claims the lamington. Halal Snack Pack or "HSP" is a Middle-Eastern inspired dish common at kebab shops around Australia. It consists of doner kebab meat served over hot chips and covered in sauces (usually chilli, garlic, and barbecue). ^ a b c d "Australian food and drink". Cultureandrecreation.gov.au. 23 September 2008. Archived from the original on 22 March 2011. Retrieved 17 September 2011. ^ "Vegetable industry". agriculture.gov.au. Department of Agriculture and Water Resources - Commonwealth of Australia. Retrieved 6 December 2018. ^ "Modern Australian recipes and Modern Australian food : SBS Food". Sbs.com.au. Retrieved 17 September 2011. ^ Weule, Genelle (20 July 2017). "Ancient Indigenous rock shelter rewrites Australia's human history". ABC News. Retrieved 15 December 2018. ^ "About Native Australian food". SBS. 1 July 2008. Retrieved 17 March 2017. ^ author. "Kangaroo and wallaby". NSW Environment & Heritage. Retrieved 15 December 2018. ^ "Grub's up!". Australian Geographic. 14 February 2017. Retrieved 15 December 2018. ^ "Aboriginal Weapons". www.mbantua.com.au. Retrieved 15 December 2018. ^ Miskelly, Greg (13 November 2017). "Aboriginal people spread native plants by hand: study". ABC News. Retrieved 15 December 2018. ^ Wright, Warwick. "Aboriginal Cooking Techniques" (PDF). www.anbg.gov.au. Retrieved 15 December 2018. ^ Newling, Jacqui (2015). Eat your history, stories and recipes form Australian kitchens. Sydney, Australia: Sydney Living Museums and NewSouth Publishing. pp. 19–62. ISBN 9781742234687. ^ O'Brien, Charmaine (2016). The Colonial Kitchen. USA: Rowman & Littlefield. pp. Chapters 1, 2, 7. ISBN 9781442249813. ^ "1788 | Australia's migration history timeline | NSW Migration Heritage Centre". Retrieved 15 December 2018. ^ "Australian farms and farming communities - australia.gov.au". Cultureandrecreation.gov.au. 10 May 2011. Archived from the original on 8 April 2011. Retrieved 17 September 2011. ^ a b "In 30 years, how might climate change affect what Australians eat and drink". Bulletin of the Australian Meteorological and Oceanographic Society. 29 (1): 22–27. 2016. ^ Internet, Chirp. "Farm Facts | National Farmers' Federation". www.nff.org.au. Retrieved 15 December 2018. ^ Tapsell, L. (2007). "Meat in the context of the whole diet: A social and cuisine perspective". Nutrition & Dietetics. 64: S108–S110. ^ Winsor, B. "More than 10% of Australians are now vegetarian". sbs.com.au. SBS. Retrieved 6 December 2018. ^ "Dairy Australia - Consumption statistics". Dairyaustralia.com.au. Retrieved 23 January 2018. ^ "Add Milo to everything this year: Your favourite malty drink is sky-rocketing to hero status". Food24. 11 May 2018. Retrieved 15 December 2018. ^ "Australia's wine industry". Cultureandrecreation.gov.au. 14 December 2007. Archived from the original on 17 February 2011. Retrieved 17 September 2011. ^ "Changing beer habits to blame for profit decline". ABC News. 23 September 2011. Retrieved 9 December 2011. ^ "How Australian Coffee Took Over—And Why New Zealand Coffee Could Be Next". Vogue. 1 January 2018. Retrieved 10 December 2018. ^ Pearlman, Jonathan (28 September 2015). "Who invented the flat white? Row breaks out between Australian and New Zealand cafe owners". ISSN 0307-1235. Retrieved 15 December 2018. ^ "Vittoria Coffee". Vittoriacoffee.com. Retrieved 23 January 2018. ^ James Braund. "Caffeination: Australia's (obsessive) coffee culture - travel tips and articles". Lonely Planet. Retrieved 17 September 2011. ^ "Australia's secret weapon is quietly changing New York". News.com.au. 30 July 2018. ^ "Granny Smith and her Apples". Archived from the original on 11 August 2007. Retrieved 11 August 2007. ^ "Horticulture fact sheet". agriculture.gov.au. Department of Agriculture and Water Resources - Commonwealth of Australia. Retrieved 6 December 2018. ^ Woodgate, Thomas (3 November 2011). "Australian food: 40 dishes locals like to call their own". CNN Travel. Retrieved 27 July 2015. ^ "KIAA - Kangaroo Meat Cuts". Kangaroo-industry.asn.au. Archived from the original on 4 March 2016. Retrieved 17 September 2011. ^ Meat consumption, OECD Data. Retrieved 6 December 2016. ^ "Aquaculture industry in Australia". agriculture.gov.au. Department of Agriculture and Water Resources - Commonwealth of Australia. 2018. Retrieved 17 September 2018. ^ "Fisheries Home". DAFF. 13 September 2011. Archived from the original on 25 September 2011. Retrieved 17 September 2011. ^ "BBC - Ever Wondered Food - History". 18 November 2004. Archived from the original on 18 November 2004. ^ "Vegetable growing in the Central West" (PDF). Dpi.nsw.gov.au. Retrieved 23 January 2018. ^ "Vegemite turns 90: what's your favourite iconic Australian brand?". ABC. ABC News. 25 October 2013. Retrieved 10 December 2018. ^ "Pavlova page". Aussie-info.com. Retrieved 17 September 2011. ^ Goldsmith, Susette (12 July 2008). "Pavlova palaver". Noted. New Zealand Listener (Bauer Media Group). Retrieved 12 February 2019. ^ Sas, Nick (4 December 2010). "Hands off our pavlova, Kiwis warned". The West Australian. Seven West Media. Retrieved 11 February 2019. ^ "Australian burger recipe". burgers here and there. 2 March 2011. Retrieved 17 September 2011. ^ "Favourite SA Food Icon". Adelaide Today. ^ "Fritz – Traditional German Cake Recipe". www.fritzmag.com.au. Retrieved 14 October 2018. ^ "Australia's cuisine culture: a history of our food - Australian Geographic". Australian Geographic. 27 June 2014. Retrieved 14 October 2018. ^ Brown, Simon Leo (8 February 2016). "Dim sims: The history of a Chinese-Australian icon". ABC News. Retrieved 15 December 2018. ^ "Top ten Tasmanian food specialities". www.tasmaniatopten.com. Retrieved 14 October 2018. ^ "Q150 icons list". Brisbane Times. 10 June 2009. Retrieved 14 October 2018. Newling, J., 2015. Eat Your History: Stories and Recipes from the Australian Kitchen. Sydney Living Museums. O'Brien, C., 2016. The Colonial Kitchen: Australia 1788-1901. Rowman & Littlefield. O'Connell, J., 2017. A Timeline of Australian Food: From Mutton to Masterchef. NewSouth Publishing. Santich, B., 2006. The high and the low: Australian cuisine in the late nineteenth and early twentieth centuries. Journal of Australian studies, 30(87), pp.37-49. Wikimedia Commons has media related to Cuisine of Australia.